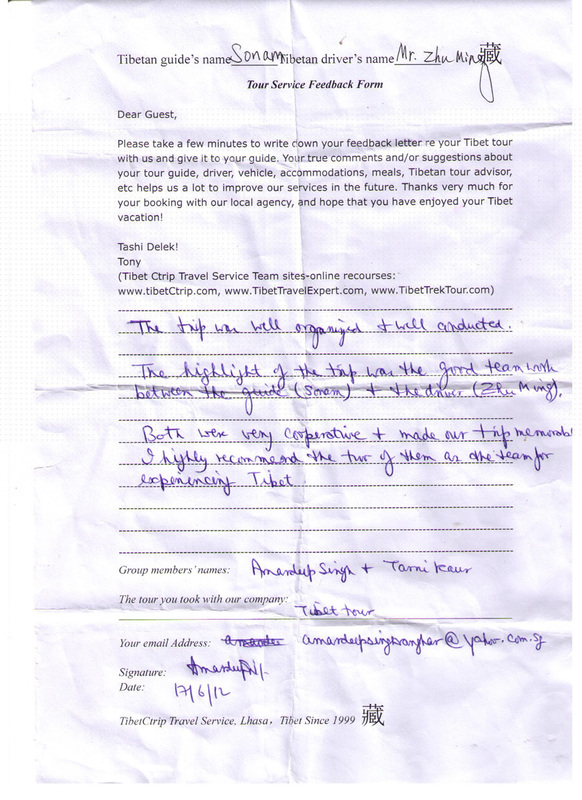 2 Singaporean-Indian Tourists traveled with us from June 3 to June 18, 2012, Group photo of Tibetan tour guide Sonam Duojie, Driver Mr. Zhuming and our distinguished clients as shown on Mr. Amardeep R Singh’s website, check out the handwritten Tibet Kailash Travel reviews20120603. The Tibet Itinerary: Chengdu-Lhasa-Everest-Lake Manasarovar-Kailash-Nepal, read more details for this Tibet trip and to enjoy and share their Amazing Tibet Kailash Travel Photos Album. Click to enjoy Tibet travel pictures by expert photographer Mr. Amardeep R Singh in Singapore “Amardeep.r.singh (at) aexp (dot) com.